Welcome to Plumbers & Steamfitters Local 442 website and possibly a new career. Take a few moments to explore all that we have to offer. Productivity, safety, and membership are three great reasons. The piping apprenticeship is a five year program where you will earn as you learn. We follow strict policies to ensure that everyone receives the best level of service. You want highly skilled workers delivering quality products. And we want to deliver that. The Plumbers & Pipefitters have serviced the construction community since 1889. In November 1904 the Plumbers, Gas and Steam Fitters were given a charter for Stockton California and became Local Union 492. In January of 1920 the Plumbers and Steam Fitters were given a charter for Modesto California and became Local Union 437. In 1997, the Stockton and Modesto local unions merged into the Plumbers, Pipe and Refrigeration Fitters Local Union 442. The new Local covers an eight county jurisdiction in the San Joaquin valley and Sierra foothills. 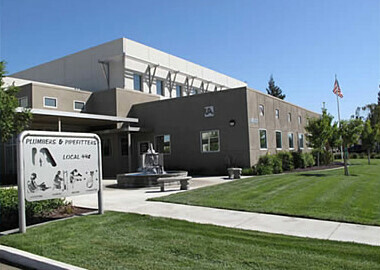 In June of 2006 Local Union 442 moved into a state of the art administration and training facility, located in North Modesto. The new 25,000 square foot building features a Union Hall Assembly Area and Local 442 Administration Offices. The Training Center consists of 7 classrooms and 4 shops which include an 18 computer CAD room, an architectural drawing classroom, a refrigeration training shop, a pipe fitter training shop, a plumbing training shop and a welding shop where stick, MIG and TIG are taught. The members of Local 442 are highly trained professionals that have served a five year apprenticeship or equal.Continuing Education & Apprentice training is an important part of the Local 442’s Operation.